The Johns Hopkins University Applied Physics Laboratory, which collaborates with NASA at the New Horizons mission, has published a new image of the Kuiper Belt Object cataloged as 2014 MU69 and nicknamed Ultima Thule which offers more details of its geological features. Various pits, the great depression on the smallest lobe, the “collar” that joins the two lobes, clear and dark features will be studied to get answers to the many questions posed after receiving the first images taken by the space probe in its New Year’s Day 2019 flyby. 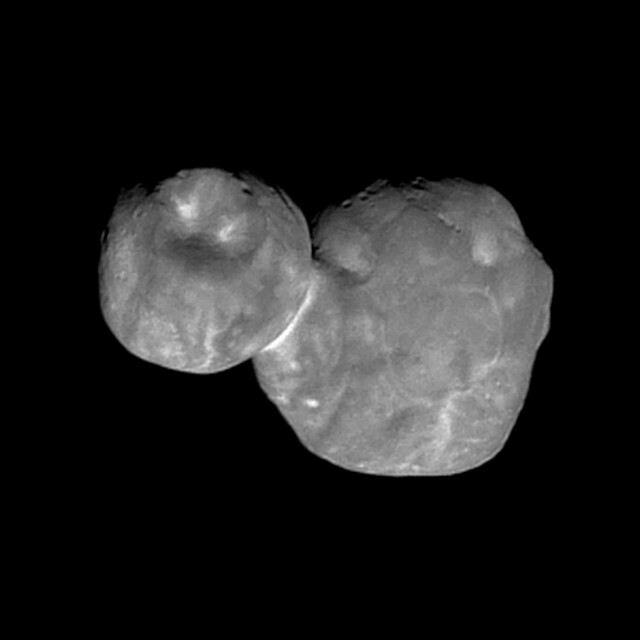 The first days of 2019 were characterized by the excitement following the confirmation of the success of the New Horizons space probe Ultima Thule flyby and the arrival of the first photos, which revealed this object’s shape allowing to establish that it’s formed of two smaller asteroids that merged and little else. For some days there was a communications blackout due to the Sun, which was between the Earth and New Horizons, but communications resumed regularly and thus the reception of increasingly detailed images. An image taken by the Multicolor Visible Imaging Camera (MVIC) component of the New Horizons’ Ralph instrument from a distance of 6,700 kilometers (about 4,200 miles) from Ultima Thule, about 7 minutes before its closest approach, arrived on January 18-19, 2019. This image was improved using a process called deconvolution and the result already shows various details of this object that can begin to be studied waiting for even more detailed images. The image (NASA/Johns Hopkins University Applied Physics Laboratory/Southwest Research Institute) offers a view of the great depression on Ultima Thule’s smaller lobe but also shows a series of smaller pits, with diameters up to a few hundred meters. The details are not yet sufficient to understand whether they are impact craters or were produced by other processes such as collapse as a result of the loss of volatile compounds that can slowly sublimate even at 6.5 billion kilometers away from the Sun. The photo is in black and white but it’s still possible to see that some areas of Ultima Thule are lighter and others darker with differences and nuances that will offer new clues about its formation. The “collar” around the area that joins the two lobes is one of the most striking features of this object and its study will offer new clues about their merger process. The two original asteroids are two primordial building blocks like the ones that formed the planets merger after merger, so understanding an object of this kind can help to better understand planetary formation. Different building blocks can carry different compounds: Ultima Thule could be a potential comet left inactive due to its distance from the Sun but similar objects could have brought water to the inner planets. Gravity grabbing plus connection in time. Copyright © 2019 Tachyon Beam. Powered by WordPress and Stargazer.